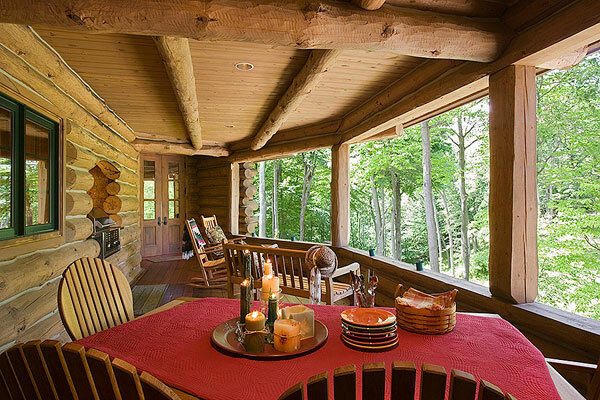 A Michigan couple favored log siding — until they got a look at real logs. When Evan and Terri Dufendach decided to build a rustic home outside Grand Rapids, Michigan, they planned it to be stud-framed with log siding in and out and a log roof system. After drawing a rough plan, however, they realized that siding just wouldn’t do. Handcrafted red pine timbers support the back porch. The posts were squared in case the homeowners decided to add screens later. Terri selected weather-resistant teak furniture for comfort and durability. While looking into alternatives, Evan accepted an invitation to visit a full-log home being built nearby. "I went alone and was hooked the moment I walked through the door," he recalls. "It took less than 20 minutes to get Terri there. 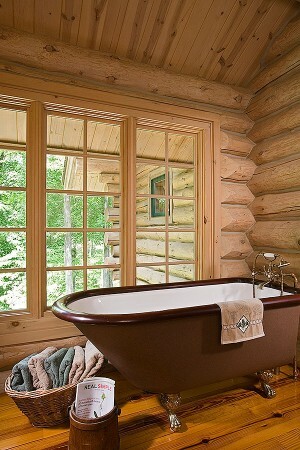 The home was absolutely gorgeous, and we would then not consider anything less than handcrafted full logs." The Dufendachs shared their concerns about log construction with the builder, Dennis Carpenter, owner of Sawmill Creek Woodworking, and with Eric Gordon, vice president of Maple Island Log Homes, which provided the home’s large-diameter red pine logs. The two men explained that most problems people had with logs occurred years ago and were attributable to lack of knowledge and poor planning. "They pointed out exactly how problems are avoided," Evan says. 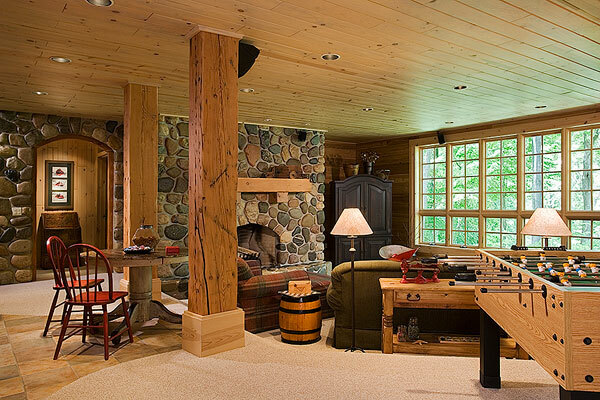 Terri and Evan worked with Gordon Hughes, Maple Island’s architect, to adapt their design for logs, creating a ski lodge look and feel. To take further advantage of the full-log look, they requested log valley rafters to give the roof a more finished look. They also added a small loft office-studio above the kitchen to give it a more intimate feel. The tapering staircase, which builder Dennis Carpenter crafted from a cherry tree on the property, incorporates the tree’s natural contours, as well as its distinctive irregularities in the handrail and spindles. Skylights in the purlin-and-gable roof system illuminate the loft. 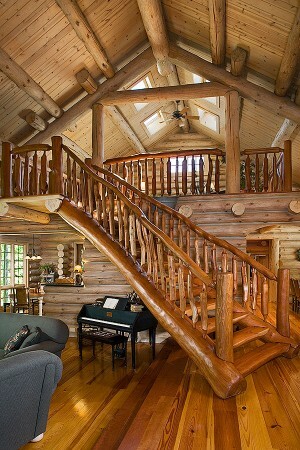 The loft is accessible by a magnificent cherry log staircase, which became the home’s focal point. "We found a tree on-site with a huge bend in it," Evan explains. "Dennis made both of the stringers for the staircase out of that one tree and tapered it so that it is narrower at the loft than it is in the great room. His eye and skill with the pocketed half-log steps and the irregular handrails and spindles make it a true work of art and a favorite feature." "It’s perfect for taking prom pictures," Terri adds, noting the couple regularly hosts high-schoolers for a Young Life outreach ministry. Evan, a commercial developer and contractor, acted as the general contractor but relied on Carpenter to add his wisdom, skills and resources. "The home truly is a tribute to Dennis," Evan stresses. "Without his experience and creative genius, I would have built in my own troubles and missed opportunities for adding unique character." The 6,500-square-foot home features a sunken great room with a view through an expanse of windows. To achieve the space they wanted for entertaining, the Dufendachs placed the kitchen, dining room and sunken breakfast room to the right of the entryway. To the left of the great room is Evan’s office with built-in bookcases, two antique desks and a drafting table. The master suite lacks doors, allowing Evan and Terri to walk unimpeded between the bedroom, bath and walk-in closet. "We thought it would be nice to have a fire in the great-room fireplace and then be able to enjoy it when we went to our bedroom," Evan says. "Thus, we designed the home with a two-sided, wood-burning fireplace between the rooms. We can close off the bedroom side when we want privacy." Evan and Terri renovated an 1893 L. Wolff Mfg. tub with brass feet and a mahogany ring around the cast iron body for their master bathroom. They built the home over a basement foundation, which they finished with western red cedar paneling. The space features a large recreation room with kitchenette, a workout room, a computer room tucked under the stairs, a full bath and two bedrooms, each with its own bath. An attached two-story garage can hold three cars on the main level and five on the lower level. "Over the years, we rarely have cars down there," Terri says, "since many friends ask us to store their household belongings when they were moving." The staircase isn’t the only place where Carpenter and his son, Frank, plied their woodworking talents. They also built the kitchen and kitchenette cabinets, the bathroom vanities, cherry log handrails, custom doors throughout, and window and door frames. "Terri and I were so pleased with their work and couldn’t believe it the day our finisher, Tom VanHaften, showed up with strange torture-looking tools and started beating up on all of the cabinets," Evan recalls. "We just couldn’t watch, but we both love the distressed look he created. I couldn’t believe I was paying someone to damage our woodwork. After all, I had sons." Evan contributed his own ideas. One day, he asked Terri how she felt about hanging a horse trough in their kitchen. Go ahead, she said tentatively, and the trough became the hood for the exhaust fan and lights over their island stove. He didn’t stop there. "When we first built the house, we bought a light fixture for over the dining room table, but we never really liked it," Terri says. "So Evan happened upon an old worn-out dual pony cart harness at an antique shop and knew exactly what it would become. He attached two galvanized washtubs, installed both up and down lights, suspended his new ’chandelier’ using an old rusty chain, and covered the outlet in the log above with a rusty saw blade." Hundred-year-old Douglas fir beams from an old manufacturing plant form the structural support for the home and enhance the finished lower-level rec room. A third wood-burning fireplace is the focal point. Although the Dufendachs live in the country, they’re far from isolated. They originally purchased 20 acres, intending to split the property between two homes. Because the area lacked other younger families, Terri challenged Evan to create a community for their sons, A.J. and Derek, who’re both now grown. So Evan bought 10 more acres and divided the site into 12 lots, retaining eight acres off the cul-de-sac for his family. "It was great for our boys to have other families with children close by," Terri explains. "We developed that wonderful sense of community I was hoping for." "The home turned out better than our greatest dreams," Evan says, "It was such a labor of love, I don’t think we could ever sell it."